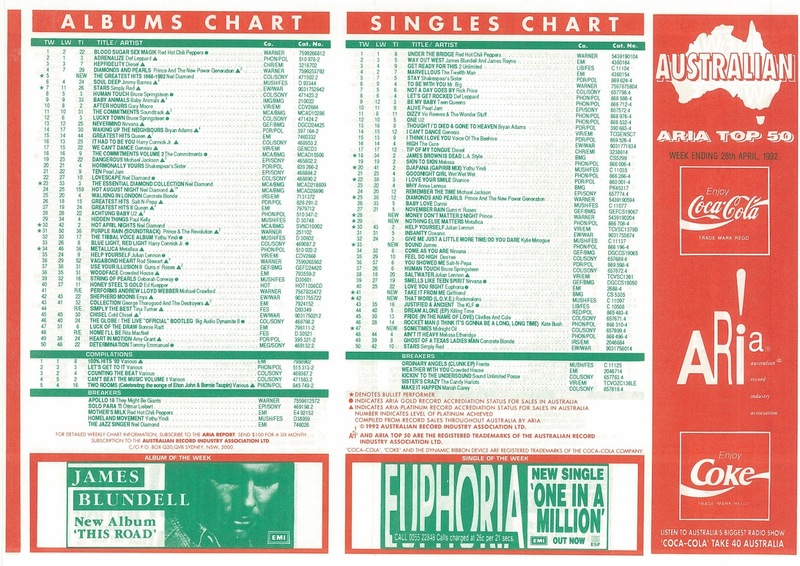 Australia was all about girl groups in April 1992. Two weeks earlier, retro-styled trio Teen Queens had debuted on the ARIA top 50 and they were joined this week by a much more modern five-piece. In fact, the girl group making its debut was about four years ahead of its time. Before Spice Girls took their brand of girl power around the world, Australia's Girlfriend followed a very similar prepackaged path to the top of the Australian chart. Before Girlfriend got there, this week in 1992, "Under The Bridge" by Red Hot Chili Peppers remained at number 1 for a second week. A single version of the song that had appeared as a bonus track on "Pride (In The Name Of Love)", "A Deeper Love" would be reworked two years later by Aretha Franklin, with C+C once again on production duties. To bridge the gap between 1990's Blue Sky Mining and Earth And Sun And Moon in a year's time, Midnight Oil released their first live album, Scream In Blue. The tracks were taken from various concerts performed between 1982 and 1990, and a 1989 rendition of Diesel And Dust album track "Sometimes" was chosen as the project's lead single. 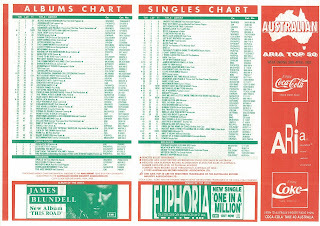 While the single wasn't that big a deal on the chart, the album peaked at number 3. By reaching number 5, their cover of "Ain't No Sunshine" had provided them with the biggest hit of their career up until that point, and Rockmelons went literally one better with follow-up "That Word (L.O.V.E.)". Once again with guest vocalist Deni Hines on board, the reggae-drenched track was so catchy and feel-good, you would've had to have been a real misery not to enjoy it. This wasn't some hastily thrown together pop combo, this was serious business. In fact, the antecedents of the group dated back even further - three of the members had known each other since they were toddlers. A fourth, Lorinda Noble, came from the same Sydney dance school, while final member Robyn Loau had been working at theme park Australia's Wonderland when she was spotted and slotted into the line-up. Teamed with perky pop tunes and a squeaky clean image, Girlfriend were ready to take on the world. And the effort paid off - well, in ARIA chart terms, anyway. The group's debut single, which was co-written by current top 10 star Rick Price, was a huge success, spending two weeks at number 1. Snapped up by a largely uncatered for pre-teen girl market, "Take It From Me" was an antidote to the misery of grunge, and the hyper-sexuality of other pop stars like Madonna, Kylie Minogue and Melissa. With their smiley faces, girl-next-door outfits and, yes, those flower hats, Girlfriend were the pop act every mum wanted their little girl to like. And it seemed like every little girl did just that. The career of British indie band James had just taken off in the UK with the re-release of "Sit Down" peaking at number 2 in 1991, followed by this lead single from Seven also reaching the UK top 10. Locally, "Sound" became James's first chart appearance - and the track, which was considerably shortened for single release from its six-minute album version, would also end up as their biggest hit here. Like the two singles from Metallica before it, rock ballad "Nothing Else Matters" had no trouble reaching the ARIA top 10 - and in fact, peaked slightly higher than either "Enter Sandman" or "The Unforgiven". Both that achievement and the fact Metallica had already been in the top 50 albums chart for eight months suggests to me that "Nothing Else Matters" crossed over to people who weren't already fans of the metal band. That's hardly surprising given it's essentially a love song - written by James Hetfield about being on the road and "missing my chick". Diamonds And Pearls had also enjoyed a lengthy stay on the albums chart - six months, mostly spent inside the top 10 - but Prince & The NPG had no trouble racking up a fourth top 20 hit from the album with this deceptively laidback track. Despite its cruisy feel, "Money Don't Matter 2 Night" was Prince's first issue-driven hit since "Sign O' The Times", dealing with various effects money has on society, such as poverty, gambling and governmental greed. Next week: three Australian (with a little bit of New Zealand) debuts, with some hip-hop, some indie and some good old fashioned pop/rock in the mix. I have this vague memory of seeing Girlfriend being interviewed on The Afternoon Show and they either performed, or cut to a video of, them performing "Take It From Me" in Japanese. My sister said, "It's just the English version sung in a Japanese accent!" I remember an instance when my dog at the time turned his head/ears from side to side when 'That Word' came on the radio. The perfect breakfast radio show song. Someone told me a while ago that 'Take It From Me' was heavily discounted after a few weeks, which no doubt helped propel it to #1. A Smash Hits review from someone (I forget who) said it was "too Bobby Brown-sounding" for their tastes. It's a shame the 'Sound' video isn't on YouTube (and is presumably blocked). A grower, I didn't realise I liked the song until just before it fell off the chart, by which point it was too late to tape off rage. Despite peaking lower, 'Laid' seems more well-known/remembered here, I'd say. I liked 'Nothing Else Matters' in small doses, but it goes for too long, and I don't care for the more 'metal'-sounding guitar solo bits.